I find it strange how some guys spend an hour or more breaking slurry with naguras. I used to do the same thing. Then I became enlightened. Lol. Be careful on the Le Dandy, it looks like you are honing on the stabilizer, which may be keeping the heel half of the razor off the stone. A quick look with magnification or ink the edge and see if you are making Full contact with the stone. Simple heel correction will resolve this issue for you, there are post on how to correct a heel with a diamond plate. BTW, nice test razor, clean the blade with some 0000 steel wool and metal polish or you will be pasting your strop with rust and tarnish from the blade when you strop, rust is very abrasive. I've tried my best not to touch the stabilizer, but I guess I'm behind the learning curve. I did ink the edge a couple of times, especially during bevel setting. There is a slight warp to it, but in the end my rolling strokes worked as I had an uniform bevel. Still waiting for that loupe. I did correct the heel on the Chabaz as it had a hook when I got it. I guess I have to redefine my ideas of rust. I did not consider this razor to be rusty. The black spots above "Le" I thought were pitting. Rust comes in many colors, not just red active rust. Once it is on your strop, it is a pasted strop, but you don’t know the grit size, and it is difficult to remove fully. Correct the heel and move the corner of the edge forward of the stabilizer an eight to a quarter of an inch. See if that improves your edges. You are right at the edge, the beginning of the stabilizer. Some colored ink on the spine and stabilizer will tell you quickly if you are riding on it. Two layers of electrical tape would probably give you enough clearance but a couple minutes on a diamond plate will make it a non-issue and give you a nice shaving heel. Use a quarter or fifty cent piece to reshape a genital curve then grind to that shape ahead of the stabilizer. Two layers of tape will also almost make up for the lost steel. I do appreciate a nice genital curve. Speedster, dinnermint, Euclid440 and 2 others like this. If I decide to use tape, do I have to start from bevel setting? No, depending on the stone, you will put a mico-bevel or make a double bevel. It does not matter to the shave, all that matters is if the edge is fully honed. In addition to preventing further spine loss, it will increase the angle back close to where it was originally and making a stronger edge. If the edge gets too thin, it can micro-chip and feel rough. 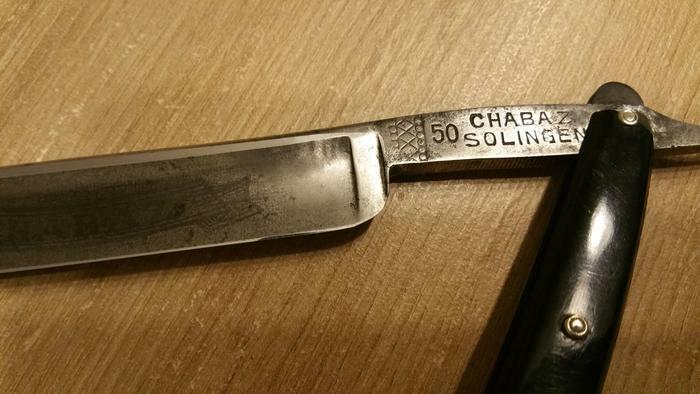 There is no down side to honing on tape, and with that razor or any razor with a lot of spine loss, it may be the only way to hone a razor and make an edge that will last and shave well. So, especially when learning to hone, always use tape. Once you have mastered honing, where you are only removing the minimum amount of steel needed to hone a razor, then you can stop using tape. By not taping that razor, you are adding another variable. cudarunner, Gasman and ppetresen like this. Listen to Marty. He is givi g hou great info. And if you follow his instructions you will get this. In my opinion you need to take back that stabilizer some more. The edge should be 1/16 to an 1/8 lower than the stabilizer. This will help you when honing. You got a good start on it but take more.